LCDR Clukey, 33, of Orono Maine, died of injuries received when the US Navy F/A-18 Hornet he was piloting crashed in the Adriatic Sea during a routine training exercise in international waters. Robert was assigned to Strike Fighter Squadron 34 embarked on the USS George Washington (CVN 73). 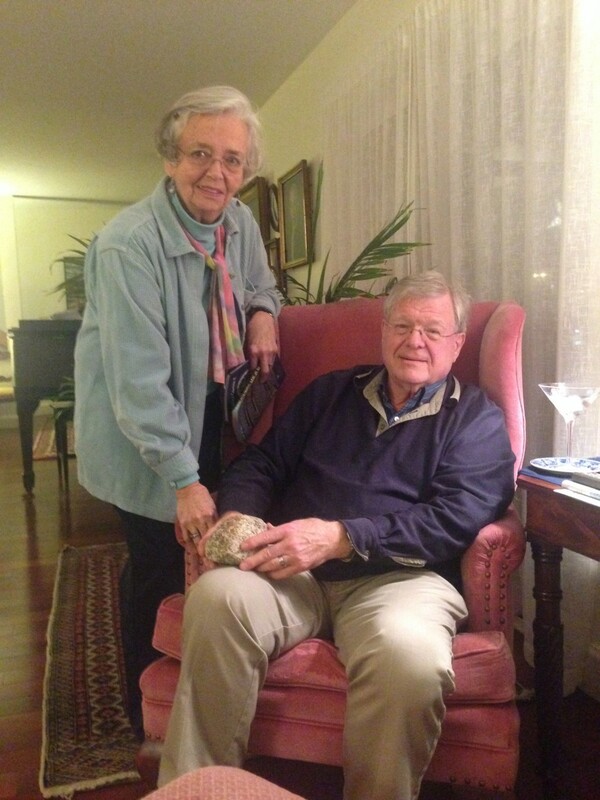 On 29 Dec, 2014, LCDR Clukey’s parents, Bob and Fran Clukey of Bangor, (who have ties to Bangor residents in the 18th century), donated a memorial stone in honor of their son. They shared this stone and many stories of their son. The stone was unearthed and retrieved from the family camp on Lucerne Lake in Maine. The stone is granite and has special meaning to Trey and his love for Maine. He spent his childhood on that lake and the stone represents Trey’s work ethic, down to earth nature and love for the outdoors and Maine. Trey was born in Bangor, Maine and attended Orono schools and graduated from OHS in 1987. He was a member of St. John’s Espicopal Church in Bangor. During high school, he was active with the Orono Rescue Squad as an EMT, the Sugarloaf Ski Patrol, and the Dirigo Search and Rescue team. Trey was nominated and accepted to attend the U.S. Naval Academy and graduated in 1991. He was a member of the sailing team and deliberately chose to be an Oceanography major, (over Aeronautic engineering) so he could keep his grades high enough to be selected for Naval Aviation. Ever since the movie Top Gun, Trey wanted nothing more than to be a fighter pilot. Trey earned his wings of gold in 1994. He became an F/A-18 pilot and served two torus with the Pacific Fleet on the USS Carl Vinson and the USS Abraham Lincoln and attended “Top Gun” school and transferred to the Atlantic Fleet. He was an instructor at Strike Fighter Weapons School Atlantic and then served as a Tactics Officer for VFA-34 Blue Blasters. Trey Flukey loved to fly. He loved talking about flying and loved everything about Naval Aviation. In summary, Trey died doing what HE LOVED. Trey struggled with a learning disability during his childhood that made it difficult for him to take notes and also focus to a classroom lecture simultaneously. Despite this struggle, he developed a keen ability to remember everything he heard and transcribe it later. He adapted and developed a remarkable audio memory, which served him well and helped him progress through high school and a difficult program of study at the Naval Academy. Trey loved Maine. He wanted to attend SERE school in Maine because it was near Sugarloaf. He loved sailing and skiing and his camp in Lucerne. He was always outside and looking for the next adventure. He loved the coast and the granite rocky coast of Maine had tremendous meaning to him. In fact, Trey found a small piece of granite to include in his USNA class ring, along with a few small pieces of Maine Tourmaline. Trey had a wonderful sense of self depreciating humor. He love the Navy because the dress was prescribed. He did not like to make choices about how to dress and preferred his navy flight suit over anything else. He never minded the jokes about his 7 and 5/8 size head (quite large) and the fact that his ex-girlfriends all wanted to dress him and imbue in him a sense of fashion and style. In fact, many of these fashion consulting sessions would take place in hot tubs at ski resorts where many of his past lady friends would gather together and give each other advice about Trey’s peculiarities. He loved the Trey was always afraid to forget something and there were enough Post-It notes in his home to act as wallpaper. He almost missed his own graduation from the Naval Academy because he forgot to bring the correct shoulder boards for his commissioning ceremony. Trey loved Maine. He loved the Navy. He loved flying. He died doing what he loved and his granite memorial stone and his story will be told again and again through the living memorial of The Summit Project. Maine Heroes are NOT Forgotten. My name is Colleen Ege, and on March 6, 2015 I had the honor of carrying the stone of your son seven miles through Portland. When I first heard we were going to write letters to the parents, I thought that was pretty neat. However, when it actually came time to write it I sat in front of my computer for what seemed like forever, hoping the words would just appear. What do you say to the parents of the guy who you carried on your back a week ago? I had no idea it would be this hard. So, to make it easier for me I will just tell you about the day. I woke up at 5:30 to a nice, -6 degree morning. Met everyone at USM, and then traveled to MEPS to pick up the stone. This will sound cheesy, but as soon as I received his stone I felt his presence with me. I wrapped him up in a blanket and placed him my backpack. We walked about two miles until we reached the gazebo where we would share stories and the memories of our servicemen. I had people telling me that the impact of this tribute wouldn’t hit me until we started walking and talking to each other, and they were absolutely right. I read Trey’s biography top to bottom, and even googled him to read a few different articles. I knew what I was going to say when it was my time to speak about my serviceman and that was going to be that. It wasn’t until we were all gathered in a circle and people started sharing and crying together that it hit me. I’m sad that I didn’t meet Trey and have an actually connection with him, but as I talked I felt like I had known him all my life. I walked seven miles in the freezing cold with your son. Whenever I felt too cold or my legs bothered me I would think of him and the sacrifice he made for his country. I want you to know that this experience is going to stick with me for the rest of my life. I’m so grateful for the opportunity to learn about Trey. He was a fine man and a credit to the uniform he wore. He is a true hero and his memory will continue to live on. To the family of Robert Clukey. It was such a great, amazing, accomplishing experience carrying his stone up to the summit of Bigelow mountain. It was inspiring to carry the stone of a person who died doing what he loved. It was an honor and I greatly appreciate the chance to do this. I have been part of the Summit Project virtually from its inception in one way or another but my hike to the summit of Owl Mountain this Memorial Day with Trey’s memorial stone has so much more deepened its impact on my heart and mind. I carried, not only the memorial stone for LCDR Robert “Trey” Edward Clukey III, USN in my pack, but also his picture and YOUR picture. In the same team, my wife Jane carried a memory stone and another hiker carried the stone for our son, Lt. James Zimmerman, USMC. So you see, the physical effort was far outweighed by the significance of what we all were doing that Memorial Day. I stared into your eyes, seeing — seeing the hollow in your hearts — seeing the eternal love. Seeing the pride in a son who represents the best of what all America is and can be. I see courage for the road that now lies ahead of you in this life, courage for the dark days, courage for the people that may not understand, courage to be strong for one another. But most of all, I see what made your son a hero to live and die for something bigger than himself. As I looked into your son’s eyes and thought about him, I saw a young man of purpose – determined to not squander time. I loved reading about what he invested his early years in: rescue EMT, ski patrol, an outdoorsman. I love that work ethic shown throughout his life represented in the granite memory stone from the state and Lake Lucerne he cherished. I love a man who loves the good things of Maine. I see a young man that embraced a challenge. It speaks powerfully of Trey’s character that he worked to overcome a learning disability. As a teacher, I see young people too often who take the “easy road”. I so respect your son for that. To be a man inspired by Top Gun and then dig deep, being recommended for the USNA and make his dreams reality. I find it telling of the kind of young man you raised who, struggling with learning, becomes an USN instructor . But I did have to chuckle at his “post-it dependence”. He did what he had to make it work. I hear others say, their memory stone grew lighter as they hiked. Not so for me. Your burden became mine for that moment in time. As we approached the summit, the air grew heavy with anticipation. Any frivolity was replaced with the sober reality we were all carrying good men and women’s memories to the place just a wee bit closer to our sovereign God. There were tears, hugs and tender almost embarrassing expressions of honor and respect by the twelve hikers gathered around the temporary memorial mountain top of the American flag and the stones they bore up that mountain. Mr. and Mrs. Clukey, your son is an American hero. You raised a son who has brought great honor to his parents. There is no greater love than this. Because of the Summit project, his memory and who and what he stands for is alive. Though your personal lose is great, please know that your personal sacrifice is of tremendous significance to me. It was an honor and privilege to get to know Trey and the values you instilled in him. I had the honor of carrying your sons stone today. When I first heard about the Summit Project and that we would be hosting a walk in Lincoln I knew I wanted to be part of it. When the stones we assigned I was glad to be selected to carry your son’s stone as I also served in the Navy. Trey and I both started our careers the same year, While he entered the Naval Academy I entered boot camp. While our careers took different routes I am sure we shared some of the same experiences. I was stationed on-board two ships out of Norfolk as I learned your son was as well. I loved the quiet nights out to sea and the smell of the salt water. I thought of those moments while I carried your son’s stone. I carried a shipmate’s stone today. Fair Winds and Following Seas. On October 17th Abigail and I had the privilege of carrying Trey’s stone up Cadillac Mountain. While it’s been too long since we’ve seen you, our families have been intertwined for many years. Preparing for and hiking the mountain offered many chances to think about the past and try to capture the memories of those long ago days. At Orono HS, Trey was always the dashing upperclassman. He was a wonderful athlete- I remember watching him play soccer- but what really comes to mind when I think of Trey from so many years ago was his friendly spirit. Trey truly cared for others. No matter what your age or interest he always seemed to have a smile on his face and a quick hello. I remember how excited my father was when Trey first started looking into the Naval Academy. As a Blue and Gold officer he knew the challenges of applying but saw in Trey many of his own qualities- compassion, community service, pride of country and the natural ability to lead. We followed Trey’s career with great interest and a bit of pride. Every new achievement was exciting and he lived in a world we could barely imagine. I first got involved with the Summit Project through my Girl Scout troop. Last year we waited for the hikers on the summit of Cadillac while the wind blew and the heavy mist became a steady downpour. The hikers didn’t give up that day and neither did the Scouts. Holding the stones and hearing the stories of these soldiers and sailors from their home state was an eye-opening experience for the girls. As a troop leader looking at my young charges I reflected on my own experience as a Girl Scout and how strong, yet gentle you were Mrs. Clukey to lead us on outings and the infamous camping trip in the rain. I understand a bit where Trey got his encouraging personality, love of nature, desire to teach and ability to lead. Our hike also started in the rain, but as we climbed up the mountain and as our team bonded together, the weather cleared and 2 beautiful rainbows arched over the mainland. It was almost as if one end was near your camp in Lucerne. As we hiked I thought about my first trip up Cadillac with my father and wondered how many times Trey might have hiked that very same trail with his family. In the grand scheme of things I know that carrying a rock with Trey’s initials on it won’t change history and won’t bring him back. But I do hope that maybe it eases the pain a little to know that his life will not be forgotten and his memory will live on through The Summit Project. The world is a better place for having Trey in it, even if just for a little while. Thank you for sharing him with us. I didn’t know Trey very well, but I always admired and was inspired by him — probably because my father was always so excited and proud that an Orono boy was doing so well in the Navy. I remember the sadness my family felt when his plane went down over the Adriatic. It was an unreal and terrible day for our town and I couldn’t imagine the pain that your family must have felt. When we carried the stone with Trey’s initials up the north ridge trail on Cadillac, I didn’t notice the extra weight in my pack. But I did feel the weight of sadness and awareness that he lost his life in his prime. I wished that Trey and the other servicemen and women whose stones we carried could have had the chance to climb Maine’s mountains again and to have had more time to follow their dreams. I thought a lot about him on the way up, on a hike that started out cold and grey and that ended with a big double rainbow over Mount Desert Island. Under the rainbow arch, my sister and I got to talk about Trey with the other hikers. It felt good to know that he is being remembered in this way. Thank you for giving us the opportunity to do that, and for sharing him with us. I was Mr. Clukey PR during the 2002 cruise. I first met him fresh out of boot camp and A-school, when I first arrived at VFA-34 as a new PR, a couple of months before we left for the 2002 deployment. Mr. Clukey was one of the first pilots that I met, and he I am, just an airman at my first command and I have this LCDR talking to me, I was standing at parade rest, just saying yes sir, no sir. He had a good laugh at that, and started joking around with me. I’m still stand there all nervous wondering what I should do, and I start catching on that even our pilots are just like everyone else. I have a lot of great story just for the short time that I knew him, he was never to busy to stop in the P-Way and ask you how things were doing, even if it was in the middle of the night. It was a great honor to serve with him and to be his PR, and a greater honor to have been able to call him a friend. Dear Mr and Mrs Clukey, I served with your son in VFA-34. I was the Flight Deck coordinator for our Squadron. Your son was a great man who always very jovial and always had time to talk. I was one of the last ones to see him. He was in great spirits and we talked a bit before he got in his Aircraft. The launch was toward the end of my shift and I was waiting for him to recover. When they called recovery complete, he didn’t come back. I went to our maintenance control to see if he went to the beach. That’s what they do if they Aircraft trouble and can’t make it back to the ship. That’s when I was told what happened. I was in shock and still haunts me till this day. I always wanted to talk to you the both of you and let you know my story of the events that happened that day. I appreciate the time I served with him. God Bless, ADCS Frank Lamberto, US Navy retired. Reflection from Robert Mayo – This past weekend on Saturday, April 16, 2016, I had the honor and privilege to represent fallen Maine hero LCDR Robert E. Clukey by carrying his memorial stone as part of The Summit Projects march in Newport. It was a beautiful morning that kicked off with a breakfast put on by volunteers followed by all participants mustering outside the American Legion hall which was the designated starting point. What I experienced was a coming together of a community of all ages to support those who have paid the ultimate sacrifice in defense of what some, my self included, unintentionally take for granted at times, that being our freedom and American way of life. I witnessed complete strangers offering kind words of support and even hugs for the families of the fallen. Personally I met some incredible people that I’m proud to call friends. After the walk the stone carriers and the gold star families gathered in the Newport Cultural Center where the stones will be in a display case for public viewing. Each stone carrier then handed off their stone and said a few words about their fallen hero. Being a little apprehensive at first about speaking in front of family members who have lost loved ones, about someone I have never met is understandable. But listening to the others speak before it was my turn was almost surreal. I could tell through their spoken words how they were affected by this experience from what they had learned about their fallen hero, much the same way I was. The message they sent by the way it was articulated was right on point. My eyes were watering, my heart was beating and I was choked up. But instead of feelings of anxiety I was surprisingly at ease when it came my time to speak as the words just flowed like I was in some type of auto pilot. I guess what it came down too was for me to speak about LCDR Clukey was the least I could do compared to what he and all the fallen have done for us. In closing I would just like reach out to anyone who is reading this that has lost a family member or friend and is having a difficult time dealing with the loss by saying to maybe try to attend some type of memorial event, it doesn’t have to be this one, just some place you can go and meet others going through what you are. They are the only ones that will truly understand and may be able to offer support on how they cope. I’m not sure because I didn’t ask but I’m almost positive I witnessed the same this past weekend. To the family of Robert “Trey” E. Clukey: I had the honor of honoring a fallen hero from Maine on this day May 28, 2016. My wife Diane and I were blessed to take part in “The Summit Project”, we joined in as members of the Kings Riders of Maine and were blessed again to ride among the Patriot Riders of Maine. I John York from Howland, was privileged to carry LCDR Robert “Trey” E. Clukey one of Maine’s fallen hero’s stone to a young Marine participant who will finish the climb up the mountain. As a Vet from the days of Vietnam I was overwhelmed to see the honor and respect from the different towns as we road up Hwy 95 and especially from Medway to Millinocket. Trey WILL NOT be forgotten, a true American Hero! My name is Dalton Elderkin and I climbed Big Moose Mtn as part of the summit project. I attend Nokomis high school and on 19 May we conducted the climb. The climb was hard but it was so much fun and rewarding because I was with my friends and other people. When we got to the top we had lunch and talked about our stones and the fallen they represent. When we started talking soon after it started to rain and hail. When we were coming down I fell a lot going down the mtn on wet tree branches. When we got to the bus i was so relieved when I got on it. What I learned about Robert Clukey was he was a fighter pilot who died in a training exercise. He wanted to be be a fighter pilot after watching a movie as a young boy. It was one of my biggest honor’s to carry his stone up the mountain and keep his legacy alive. My name is Maj David Forbell and on Sunday May 29th, 2016 I had the honor and privilege of carrying the stone and the story of LCdr Trey Clukey to the summit of Owl Mountain, Baxter State Park, Millinocket, ME. I am an active duty Marine Corps officer and F/A-18 pilot, so it meant a lot to me to carry Trey’s stone as we share the same profession. The things I admire most about Trey were his love for the outdoors and his strong will and determination which allowed him to achieve his goals in his pursuit of flying, which he loved. I traveled similar roads as Trey through Navy flight school and even flew off of the same aircraft carrier as Trey did when he was assigned to VFA-34, the USS George Washington, CVN-73. During the hike I carried Trey’s stone in my own personal flight bag which accompanied me on all of my flights throughout my career. As we approached the summit, my group paused to conduct the circle ceremony. This is where each of the hikers retrieves the honor stones from their packs, forms a circle, and each takes turns telling fellow hikers about the person whose stone you are carrying. I spoke to my group about Trey’s love of the Maine outdoors, his many accomplishments, such as attending the US Naval academy and earning his wings of gold as a Naval Aviator, and the strong will and work ethic that Trey embodied which allowed him to accomplish these great things in his life. I will forever remember LCdr Robert Clukey and applaud organizations like The Summit Project which provide the opportunities to discover modern day heroes, like Trey, and preserve their memories forever. I want to thank the family of LCdr Robert E. Clukey for the opportunity to carry this precious stone and for entrusting me to carry on the legacy and memory of LCdr Robert E. Clukey III. This man was the son of my middle school art teacher. Small, small world. I can’t imagine their hurt. Thank you for keeping his memory alive. What a stunning tribute to a wonderful young man. I trust his family can find peace in this final journey of Trey. “I felt such a heavy weight leave my shoulders as Robert and I reached the summit. It was an honor to carry his stone. Thank you. “It was amazing to be able to carry Robert’s stone today. I hate that he had to pass that way. He sounded like he was an amazing and interesting person, I wish I could have met him. That’s cool how we both love jets also since we were little! My name is Devon Cormack and on October 1, 2016 I carried the stone of your son, LCDR Trey Clukey, to the top of Cadillac Mountain in Acadia National Park. It was an honor and a privilege to carry Trey’s stone. The morning of the hike was chilly, and I was eager to pick up Trey’s stone. When I came into the camp and saw all of the stones on the table, Trey’s stuck out to me. From what I know of Trey, he had a happy life with a loving family. His stone, coming from his family’s lake, was smaller and smoother than most, and looked clean and refined, similar to how I pictured Trey. After picking up his stone, we boarded the bus and headed up to Cadillac. The hike up Cadillac was an experience I will remember for the rest of my life. Carrying Trey’s stone to the top of a mountain was a beautiful experience, and it was an honor to be able to take his stone on a journey with the stones of so many others who made the ultimate sacrifice for our country. When we reached the summit, I was excited, but apprehensive for the stone ceremony. Having only learned about Trey’s life a few months prior to our hike, I was worried that there would be no way that I would be able to adequately capture the way that I felt I had connected with this man I never knew on this hike. When I started to speak, my heart was pounding, and my voice shook. I know I didn’t get everything out that I planned to say. I was caught in the moment and didn’t have a chance to talk about the connection that I felt like Trey and I had, the challenges we both faced with disabilities in school and the passion for the careers that we ultimately ended up choosing. Ultimately, I want to thank Trey for living life in a way that many people want to. He followed his passion throughout his life, overcoming any barriers that he hit along the way and stayed true to himself and his friends through the end. If I could meet Trey today, I would be honored if I would be able to call him a friend. Trey will not be forgotten. Last week, my English class went to Streaked Mountain to climb and I had an amazing time. It was amazing because I was given the honor to carry your son,Robert Flukey’s stone all the way to the top of the mountain. Even though I wasn’t born in the United States, I am still thankful for what he has done for this country and state. His actions have affected this country in so many good ways. As I was carrying the stone on my back, I was complaining about how hard it was for me to make it to the top. However I realized that was nothing compared to what your son went through. It was nothing compared to what he and other people in the war went through because they are out there risking their lives to keep this country safe while I’m over here not doing anything for this country. Me carrying his stone shaped my attitude on doing something useful for this country. Climbing the mountain felt like a war to me because my enemies were the rocks,branches, and trees. Making one wrong move would have not been safe because I would’ve gotten injured or maybe killed because the mountain was dangerous. The only way to be at victory was to reach the top. Once we were at the top, my classmates and I had to speak from the heart of who’s stone we were carrying and how this soldier passed and why we are thankful for what they did for us. I am so thankful for what your son did for this country because he saved so many lives just by what he did. I read that your son loved skiing and sailing. He loved being adventurous and active. If he was still here today, I know that me and him would be great friends because I love to be active. I like to stay active by playing outside and hang out with my friends. He dedicated his life just to enjoy doing something he loved. To me, I think his stone isn’t just a normal rock. I think the stone has a meaning of him and his life. This stone represents him because he shows how he cares about Maine. He spent his childhood on a lake and the stone represents his work ethic, and love for the outdoors and Maine. Some stuff that I learned about him that was interesting are that he was born in Bangor Maine, and he struggled with learning. He couldn’t focus on a class lecture. I’m sometimes like that because I get bored with lectures. I also learned that he was a Navy pilot and he earned his wing of gold in 1994. I appreciate how he loved to fly. I had the honor to carry LCDR Robert E. Clukey stone on two occasions this past Veteran’s day. The first was up Blue Hill Mountain on on Veterans day. It was a beautiful day and my wife and daughter joined The Summit Project for this hike. The second was the Veterans day 4 mile run in Ellsworth. I can’t explain what an honor humbling experience it was. I was filled with emotions both occasion. While I read about Trey and saw her graduated from the academy the same year I enlisted in the Coast Guard. I will always remember these events and the feelings that came over me. To be carrying a true hero’s stone and being a part of The Summit Project was truly a honor. Over Memorial Day weekend 2017, 30 Gold Star family members, and a hundred or so volunteers embarked on a weekend retreat with “The Summit Project” at Twin Pines Camp Grounds near Millinocket, Maine. It was our way of expressing our thanks and remembering Maine Veterans on Memorial Day who have fallen since 9/11. It was my honor to carry the engraved honor rock of LCMD Robert Clukey and to tell his story, a story I will never forget. After reading LCMD Clukey’s life story, I related his life story growing up in Maine to that my four daughters; the oldest now is age 31. My wife and I have deep Maine roots, and three of our daughters graduated from UMaine and one from UMaine Farmington. As I read of Trey vacationing at the summer camp in Lucerne. Maine it was much life the story of many Maine families. We raised our family in Cape Elizabeth, Maine and vacationed summers on Long Lake in Naples, Maine. All of my daughters have a love for the outdoors, sports, hard work ethic, and a love for Maine. Three of them loved to ski at Sugarloaf while attending UMaine, the same as Trey. This is not to say they didn’t experience other difficulties in life like Bob, but in different ways. In reading Trey’s bio, it appeared he didn’t want to miss out on life, had a great sense of humor, and lived life to it fullest. I thought about Trey’s thrill of being accepted to the U. S. Naval Academy and becoming a naval aviator. You must be so proud of him! After a quiet two-mile walk with Trey’s engraved rock I stood in a circle with many others from the TSP. I told the group Trey’s story you had written on the TSP web page. At the end of the story, I kissed his rock, the same way I would kiss one of my own children. When I returned home, I told Trey’s life story to my wife, children, and friends. I am a U.S. Marine Corps Veteran and recently attended a military reunion in South Carolina this past weekend. Many of these men had also lost their fellow Marines while serving our country. I told these men of the “The Summit Project” and had the honor of telling your Trey’s story. I will always remember Trey’s hard work, humor, thrill of life, and service to our great country. Although I can never take away your pain or your loss, I will never forget LCMD Clukey’s life story and his service to our country. I heard about TSP from an article in Bangor Metro magazine and knew I had to do it. After arranging the hike and participants, I learned that you could request specific memorial stones and saw Trey on the honored list and made that request. I still remember you, Fran, talking so much about Trey when we worked together at VCS and I have also been to your beloved family camp so I felt a personal connection to Trey without actually ever meeting him . I also clearly remember that moment when the jet planes flew overhead to honor him at his service years ago. Trey was truly a remarkable young man and talented Navy pilot and instructor. Through TSP I was so pleased to learn more about him and be able to honor him . I also learned that we had many common traits such as his love for the lake, the outdoors, skiing and most of all sailing. We were a group of 8 women that hiked the South Ridge of Cadillac Mountain on July 6, 2017 on a glorious, sunny somewhat windy day. We were deeply moved by all of the soldiers’ stories that we shared at the top. Even though some of us were meeting each other for the first time, this experience created a special bond and closeness. Trey honored his family and his country . WIth this living memorial, we can and must remember and honor him and the others who served and sacrificed for us. Thank you for sharing Trey’s important life story. I have no idea how I found the TSP website; but, as someone once said, there are no such things as coincidences. What may have happened is that, in the process of googling Mt. Katahdin, I saw the TSP site and, noticing that it honored Maine veterans, looked to see if Trey’s name was listed. When I saw that it was, I knew, without any doubt, that I was going to hike Mt. Katahdin with Trey’s stone. The fact that his stone was from camp brought back a lot of happy memories spent there and made it even more meaningful. Over the years, I have thought of Trey often. He was a great guy who enjoyed life, its adventure, and the people he met along the way. I think he would appreciate one of my life’s mottos: If not now, when? Not until I read the information that you shared did I realize that he had a learning disability. I’m excited to share his story and his accomplishments with my students. Often, they get discouraged because they have to work harder and think their dreams are impossible. Hopefully, Trey’s story will inspire them to persevere and to dream BIG! My adventure began on August 2nd. As I stowed Trey’s stone in my backpack, hiking to Chimney Pond, then on to Baxter Peak via the Saddle Trail, I thought I’m not carrying Trey. As with all friends, they walk beside you, not in front of you or behind you. Reaching the summit of Mt Katahdin was an unforgettable moment.. but, I knew my challenge lay before me, the descent. Tired, after falling for the 6th time (not unexpected), I jokingly called out, “Hey, Trey, you’re supposed to keep me from falling.” Would you be surprised to know that I didn’t fall again? It was a memorable hike and accomplishment. On August 22nd, my 9-year-old-nephew, Logan, wanted to hike his first High Peak, Big Slide, with his mom and me. Rain was expected around 1p, but we thought we’d start early and reassess our progress late morning to see how Logan was doing. The hike went really well. Logan enjoyed climbing over rocks and learning that, in order to get to Big Slide, we had to climb the “Big Brothers” first which he nicknamed Baby, Kid, and Teenager. We arrived at the windy summit late morning and, after talking with a few other hikers at the top, decided to take a gentler trail down; plus, the latest weather forecast predicted no rain until 2p… what we didn’t know was that the alternative trail would add an extra 3 miles, turning an 8 mile hike into 11 miles! Logan was a real trooper, as we all just kept putting one foot in front of the other. Both Tammy and I were hoping that the rain would hold off and not ruin Logan’s first hike, but we were expecting to get drenched. Just as we reached the trailhead, around 4p, it started to rain and, for added excitement, thunder and lightning! We didn’t know until later that a tornado warning had been issued earlier in the afternoon! Some might say we were very lucky, but I think we had two special guides that day, my father and Trey. We never know if a person is meant to be in our life for a moment, a season, or a lifetime; but, sometimes, it only takes a moment to make a lasting impression. I think that’s what happened when I met Trey. Climbing Cadillac Mountain with Trey’s stone was my first experience with The Summit Project. As the day drew near, two objectives unfolded in my mind. One, sharing the burden of grief. And two, a mission of remembrance. The hike was easy and Trey’s stone wasn’t a burden. But I did have a familiar weight upon my shoulders. I had a brother that was born the same year as Trey, and like Trey, he was gone far too soon. Grief is a familiar burden to me. But it was Trey I thought about that day. It was his love of the ocean, his drive to succeed, his enthusiasm for life and kindness of heart. The fog was thick, but the ocean was visible beneath the haze and it was glimmering in that way only the ocean can, the blinding beauty of staring into a thousand stars. And stare I did. The ocean pulls at me, and even from that great distance it was no exception. I thought for a long time about Trey’s last moments of life. I felt that they were peaceful moments. A wash of acceptance, and almost gratitude for what life had given him. Moments that amounted to a journey. A journey into the unknown, but with trust and courage. The mission of remembrance was easier… and it wasn’t. I didn’t know Trey. But I did know about his life and I shared that with the group. Death describes the end of a living body. But it doesn’t describe the end of a person. We are so much more than the shell our soul resides in. The best thing any one person can do for those left behind is to keep their loved one’s memory alive. It is immensely meaningful. And I’m glad that I could be part of that. But there was so much more to the experience that I wasn’t expecting. There was a massive collective energy of both the living and the dead. An energy that spanned not only the huge variation in age, background, and interests, but one that spanned time. Those that physically left us long ago were there with us that day, and into the night. I saw a continuance of good will. Even after death, Trey and his brethren, through the actions of the Gold Star Families, perpetuate an immensely important purpose. They bring humankind together. People from all walks of life share deeply. They make real connections. They laugh and they commiserate. Not only do the names and the stories of our fallen heroes live on, but their mission continues after death, as they continue to serve people by bringing them together, and bringing joy and purpose into their lives. To know such good can come from something so tragic, it is a salve upon the soul to those left behind. A very sincere thank you to Trey’s family, for sharing him with us. Your son was very brave. I want to be an Air Force fighter pilot when I grow up, too! I will honor your son forever. My name is Tim, I am a Cub Scout. I carried your sons stone up Black Cap Mountain. I was able to listen to other scouts share about the stones they carried and shared Robert’s story. I am very sorry for your loss. I am sure that he was a great person. Everyone heard about Mr. Robert. My husband, Michael Bagley, had the honor of transporting your son’s memorial stone on The Summit Project’s Motorcycle Ride from Hermon to Millinocket. Though my husband is not generally short of words, he requested that I write you this message in an effort to express the privilege that he felt to honor Trey in this small way. Thank you for sharing his story. The level of perseverance that Trey displayed in realizing his dream of becoming a Navy pilot is truly inspiring and a testament to his character. Be proud of your American hero! My name is Licia Byther and I had the honor and privilege of getting to know your son, Trey! It is taken me a while to be able to put my thoughts down after spending a lot of time reflecting on our hike. I spent a great deal of time getting to know the hero that I would be carrying and representing on this trip. Your son was an amazing man! He is the type of man that I would have liked to have spent time with and been friends with. His military accomplishments are amazing to me and a true testament to all of the hard work, dedication, and commitment he gave to others and to his country. I came to admire his courage, strength, and perseverance, not just in his military career, but in everything he did in his life. His ability to dig deep and work extremely hard to get where he wanted to go in life, despite the odds, is commendable. Many in his shoes would have given up and not pushed forward to pursue and make their dreams become a reality. You must be so extremely proud of the man you raised. It was a humbling experience for me to be able to represent your son on the hike and I felt like he was with me the whole time. Thank you for giving a stone in his memory and honor. I feel like a better person for being able to connect with his story and represent him in a way I never dreamed I could. My name is Kristy Sharp and I was very honored to carry Trey’s stone twice over Veterans Day weekend. On Saturday, November 10th, our Summit Project team hiked Blue Hill Mountain. It was a dreary day, but we all had an immense sense of determination and purpose. I had done research on Trey’s life and read many of the previous reflection letters. I had no idea what an F/A-18 Hornet looked like so I did research on the jet that Trey piloted. Two things kept coming to my mind, #1 – Trey absolutely LOVED to fly and his dream had come true when he became a fighter pilot; #2 – an F/A-18 Hornet looked extremely complicated to pilot and Trey must have studied countless hours learning to fly such an aircraft. Few people are able to find their true passion and then “live” their passion and Trey was one of those people. Before the Blue Hill hike, I had printed a few notes; a photo of Trey; and a photo of an F/A-18 Hornet. On the morning of the hike, I was given Trey’s stone and the small laminated card with it. 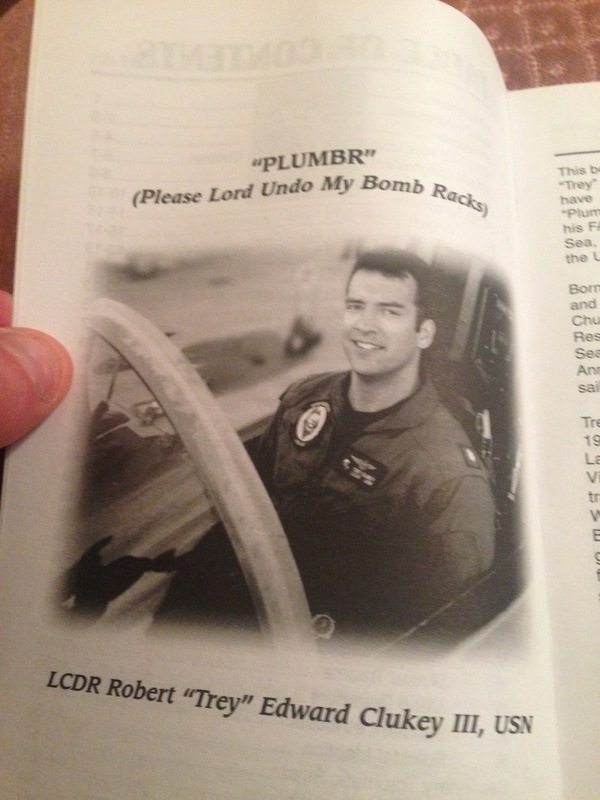 On the card is a photo of Trey in the cockpit of an F/A-18 Hornet. Yes indeed, Trey loved everything about flying. At the summit of Blue Hill Mountain, we each shared stories about the heroes we were hiking for. (I’ve done 2 other Summit Project hikes and find the sharing of stories to be very overwhelming) I told myself to “keep it together” when sharing Trey’s story. I had even put a few post-it notes on the back of my research paper with reminders of things I didn’t want to forget to share. One of those things was that Trey never wanted to forget anything and seemed fond of “post-it” notes! My name is Ellie Brady. On December 8, 2018 I was honored to carry Trey’s remembrance stone during the Millinocket Half Marathon. It’s very hard for me to put down in words how much respect I have for Trey and his family. After reading his bio, I felt an immediate connection to him. I too love to ski, the coast and anything to do outside . I also struggled in school but managed with hard work to be successful in a profession I love. For the half marathon, It was an extremely cold day with the temperature below zero. The head wind for 6 miles on the Golden Road proved to be challenging. I thought about Trey constantly on my run. I thought about how much he loved to fly and all the challenges he had to overcome to become a pilot. The presence of his stone on my back was motivating me to keep going forward and finish something I loved to do, run. I placed his flag visually on the back of my pack . Other runners on the course asked me about it. I told them about the Summit Prioject and about Trey’s life and ultimate sacrifice. I was happy to share his life with as many people as I could . The town held social events all weekend and people recognized me from the run. I was able to share his life that way too. I’m looking forward to coming back next year and running with Trey. Thanks, Ellie! Trey would have loved to run that race. You are a wonderful soul. At my place of employment, we have had the honor of being the custodian for the honor case .On this Valentine’s Day, I will hold Trey close in my heart. After reading his bio, I can see what an amazing young man you raised…he was hard working and adventurous! He followed his dream of becoming a pilot no matter how difficult the journey was. “Our flag does not fly because the wind moves it. it flies with the last breathe of each soldier who died protecting it” Thank you Trey…You are truly and American Hero! My name is Alan Foster and I have the distinct honor to carry Robert’s stone on the Baxter State hike in May. My deepest condolences on the loss of such a talented, dedicated, and honorable fellow Navy Shipmate and Airedale! I retired from the Navy in 1999 as a AGCS( Senior Chief Weather guesser). I had the distinct honor of briefing numerous dedicated pilots such as LCDR Klukey. Weather was such an important factor in flying and I always made sure my briefings were concise, accurate, and understandable. I ended up with over 700 hours of flight time myself. But enough about me! Your son left behind a legacy and was a role model to many pilots and other Sailors! I can see from his bio, that he loved life and embraced any challenge he encountered. I’m honored to carry his stone on the hike and as fellow navy vets, I feel a connection to him already! I will reread his bio so I may be able to celebrate his life with my other hikers. If you have anything more to add please don’t hesitate to call me at(513) 404-9442. I love to talk with both of you to get the full picture of Robert and his love of flying and being a Naval Officer! This is Alan Foster commenting again. In researching your ‘Trey’ and you family, I stumbled upon your Dad’s (Bob’s Dad) obituary and I have to tell you about a unique coincidence and connection to your Dad. I work for Habitat for Humanity and also do some volunteer work with the maintenance man at my Mom’s Church In Kennebunk, Maine. The church has a fair in November to raise money to support the budget. Occasionally, Tim(the maintenance man) will ask me if I would like to take items to the Habitat Restore, that the fair won’t sell. This day he offered me a small box of drinking glasses. We usually don’t sell drinking glasses, but something told me to take this box and at least look at the glasses. When I looked at the glasses later that day, there were what looked like cocktail glasses (3 of them), inscribed with the railroad name of Aroostook and Bangor Railroad. They are unique looking glasses, so I decided to keep two for myself and give one to my grandson, who loves trains. This happened weeks before I saw your Dad’s Obituary! So, you can imagine when I read about your Dad working for the same railroad inscribed on the glasses, I was stunned!! I have no idea who donated the glasses to the church, but the fact that I have possession of two of them, tells me that I was meant to carry Trey’s stone this Memorial Day! As my Supervisor Bob Haskell ( who is deeply involved in the Summit Project) told me after I relayed the same story to him…..that the stone chooses you instead of it being chosen for you…..I can not deny his statement is not true. Could it be Trey’s Grandfather, (your Dad) had some part to play in my obtaining these glasses. I would be more than willing to give you one or both of the glasses as a Memorial to your Dad’s service to the Railroad. Having relayed this story to you, I feel even more connected to Trey and your family! It will be my distinct honor and duty to carry Trey’s stone on the Baxter State hike! I stand in awe at this awesome responsibility in honoring your son! !